Choose a card from our collection to get started. 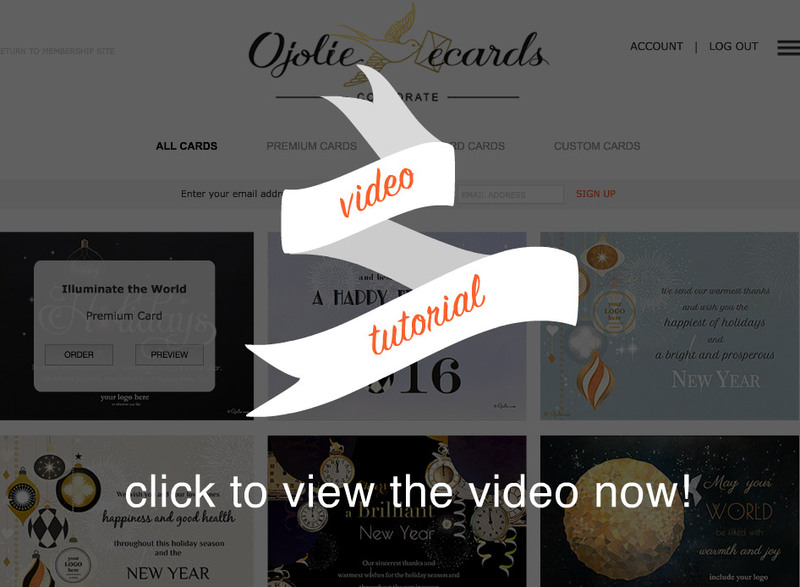 Or watch our tutorial below to see how easy it is to design your card. There is still time - most orders are processed within 24 hours right now! THERE IS STILL TIME Turnaround time is just 1-3 days, so order now and send out your holiday card in time! a card using our design interface. if you would like to design a card using our design interface. for more information, a quote and a full information package on customization. Please access our site from a desktop or laptop if you would like to design a card. The tutorial below is also best viewed on a larger screen. In three easy steps you can design the final look of your card. You will need to upload your logo, place and resize it and design your text. Detailed instructions for each step can be found below. Or watch our tutorial video to quickly learn how to use our new design interface. We will use this design to add your logo and text to the animated card after your place your order. We will send it to you for final approval. You will not be able to preview the animated card with this design, but this gives you an idea how the final frame of the animated card will look with your text design and logo placement. Please upload a large enough logo with a transparent background in .png format. To upload your logo, click on the upload button at the top of the design interface. After uploading your logo, the logo will be displayed in the default position in the design preview. You can move your logo by selecting it with your mouse and moving it to a new position while holding down the mouse button. You can resize the logo to be smaller than the original size by using your mouse to pull on the boundary corner of the logo. There will be a boundary guide in the preview that will not be visible in the final card. Please make sure the logo is clearly visible against the background color. Generally you will want to select a card with a contrasting background color to ensure good visibility of your logo. In the video tutorial you can see examples of good and sub-par logo placement. You can upload a different version of your logo if the current version does not work on the background of the card you have chosen. Sometimes the best solution is to ask for expert help in making your logo stand out in your card of choice. We are happy to help you with this for a small fee. Please contact us for more information. You can design the placement, font, size and color of your text. Each card can accommodate up to three text areas, that can be added or removed by selecting one of the three TEXT icons at the top of the design interface. Default text and design is provided at the start of the design process as some clients prefer to use this as is, or start from there instead of from scratch. You can display or hide text areas by selecting and unselecting the TEXT icons at the top of the design interface. To modify the text in a text area, use your mouse to click inside the text area and text editing options will appear. To edit another text area or your logo, click into those areas. You can save your design at any time during the design process via the SAVE DRAFT button. If you need to leave and retrieve your design later, you can do so via the draft list in your ACCOUNT. If you do not click the SAVE button your design will not be saved unless you click the ORDER NOW button, which automatically saves the design and takes you through the final steps of the ordering process. Once you have finalized the final steps of the ordering process your design will no longer appear in the draft list. Instead it can be viewed by accessing your ORDER HISTORY. Changes to your draft after this will require additional payment as a re-design if your order is already in production.